e-phem-er-a: something short-lived (Greek: ephemere, for one day). TO STARE into the face of an ancestor (literal or spirtual), frozen in the moment of a camera's shutter long before you were born! To hold in your hand a delicate card or invitation, perhaps a poster. Things hardly contemplated to last beyond the occasion or the generation, but miraculously preserved to our own day. If you are a new collector, you may not have realized that such things can be obtained. If you are a veteran collector, you own such things already, and treasure them for a lifetime. A nice size in attractive hand-colored pastels, waiting to be framed on your wall. Click here - or on the picture - for a detailed illustrated description. POLYGAMY THEME VICTORIAN ADVERTISING TRADE CARDS, ca. 1880s. Complete set of four cards cut in the shape of small fans printed in silver or gold. When two women must have the same man, Utah was the answer, at least in this comical series. Perfect for display! Click here - or on the picture - for a detailed illustrated description. Preserved by followers of James J. Strang. Click here - or on the picture - for a detailed illustrated description. JOHN C. BENNETT (M.D.) promotes the brand-new State Medical Society of Illinois from Nauvoo. Early 1841. Signed by two men hand-picked by Joseph Smith to obtain the all-important Nauvoo Charter. Intriguing and rare, if not unique. Click here - or on the picture - for a detailed illustrated description. The first mention of the lost race of the Jaredites and the discovery of the twenty-four gold plates containing their history. Click here - or on the picture - for a detailed illustrated description. The Angel Moroni has (just?) been set in place, but there is still tape on the windows, and we see a workman with his ladders on a spire! Click here - or on the picture - for a detailed illustrated description. A portion of an actual page from the 1830 edition, from the Book of Ether. Click here - or on the picture - for a detailed illustrated description. 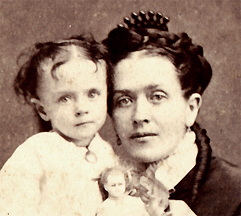 Picture at the top of this page: I think often of Mrs. Dunford, whom you see above, holding her daughter with the doll. Partly because she looked so much like my own mother, and because I found (years before discovering this photograph) an original letter of introduction written for her to carry on the newly-completed transcontinental railroad to Ohio to meet her grandmother whom she had never seen. She was a young married woman venturing East with her husband. The letter she clutched (now owned by the Church of Jesus Christ of Latter-day Saints) promised her aging grandmother that she would come forth in the morning of the resurrection. It was written by young Mrs. Dunford's father, Lorenzo Snow. Photograph labeled on the back in the handwriting of Eliza Snow. Sold in 2000.